quarrygirl.com » Blog Archive » Hungry Tiger Too: Great vegan food and beer in a real bar! Hungry Tiger Too: Great vegan food and beer in a real bar! this bar serves some of the best vegan food i've ever eaten. 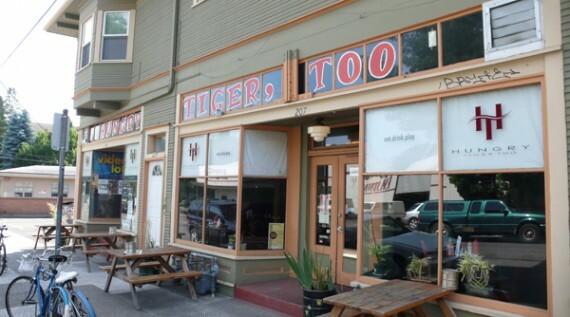 Situated on a quiet street next to a coffee shop in Southeast Portland, Hungry Tiger Too looks at first glance like any other neighborhood bar. However, in addition to the usual bar accoutrements of beer, fries and TVs, Hungry Tiger Too has a HUGE vegan menu, serving an array of awesome animal-free bar food morning, noon and night. On our recent trip to PDX we grabbed a seat at the bar, ordered a beer and started to scan the vegan section of the menu. As usual in Portland, though, we were torn between so many amazing menu items that we over-ordered, somewhat and ended up spending way more time there than we expected to. Anywhere else, this would have been a problem, but Hungry Tiger Too is just so wonderful that we were delighted to eat and drink the afternoon away within its hallowed walls. 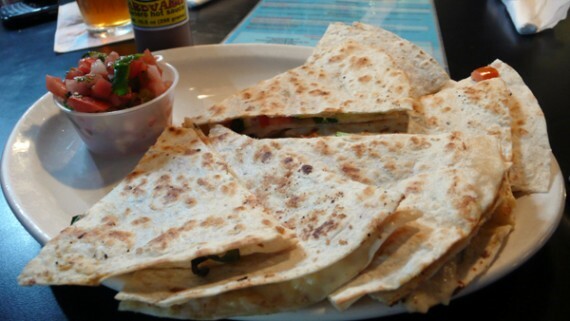 First up was the vegan quesadilla appetizer: a super rendition of the popular Mexican-influenced dish. Liberal helpings of tomatoes, onions, spinach, cilantro and vegan cheese filled up our vegan bellies in no time, so we were forced to have another beer while waiting to order our main dish. Well, one beer became two, then three after we played some pinball and goofed around in the photo booth. Next up were main courses, the Montecore Burger, and Home Made Biscuits and Gravy. Let’s get this out right now: The burgers on the menu are all based on the ubiquitous vegan Boca Burger, which at first had me thinking “WTF? I can make one of these at home!”. Well, I could (and I tried, see later) but it couldn’t be anywhere near this tasty. 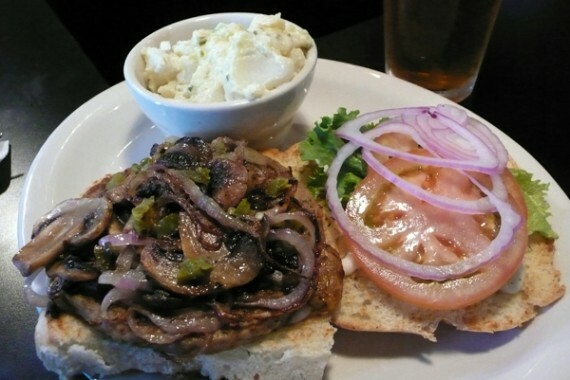 The Montecore was a fusion of zesty garlic, spicy jalapeno and an smooth sauteed mushroom/onion topping that was to die for. Add in some fresh trimmings (tomato, lettuce and onions), and this was one hearty vegan burger. Throw in the included side of incredible vegan potato salad, and for only $8.75 you have one of the most delicious and best value meals I’ve ever eaten. As we were already full after the quesadilla we ordered the Biscuits and Gravy as a kinda side for the burger (at only $4, how big could it possibly be?). Very big is the answer. Very tasty too. Creamy vegan mushroom and sausage sauce, smothering two crispy and moist biscuits was a winning combination. After another beer, and another, we were finally able to finish all the food, and stagger out of the bar to our hotel. Later on in the evening, the reality of our experience hit us: We’d just enjoyed a great afternoon in a real bar with awesome beers and completely filling, decadent cruelty-free food. I can tell you this: After buying and cooking a bunch of Boca Burgers from Coscto, I’ve never come close to approximating the taste of that awesome burger. If I lived in Portland, I’d probably visit Hungry Tiger Too at least once, or twice a day week. 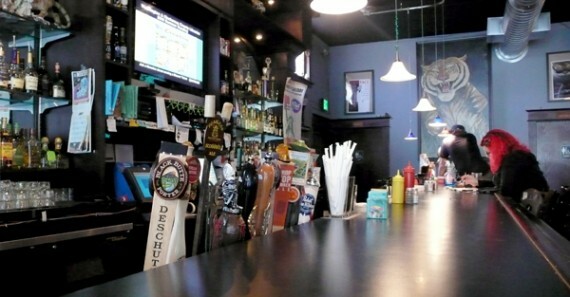 Awesome bar, awesome staff, awesome beers, awesome food. DUUUH?! Vegans: Go there now. haha… i always try to recreate things from restaurants and i always fail. 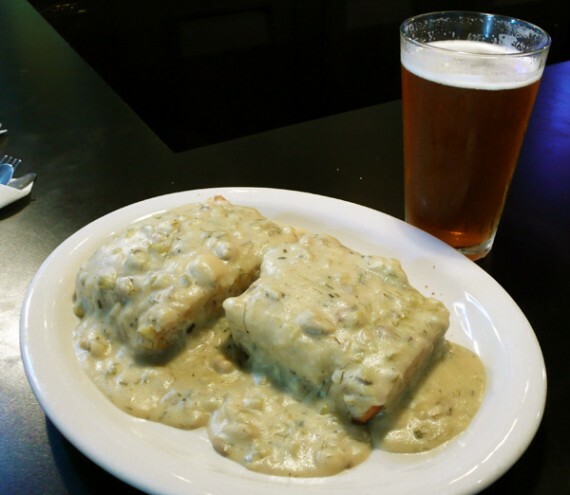 those biscuits and gravy look AWESOME. The burger looks tasty, but those biscuits and gravy are making me salivate! I need to hear much more about those biscuits and gravy. Hah, I always tell myself “I could totally make this at home” when I’m out eating something and then when I try it doesn’t quite turn out as well as the original. 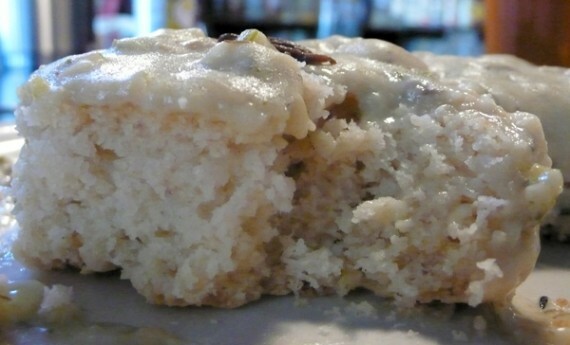 Now I really want to go get some biscuits and gravy… mmm. Wow, that looks like one huge plate of biscuits for 4dollars! 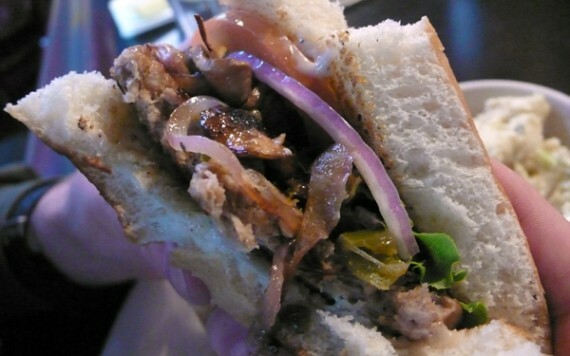 Try the Sunshine Burgers; I think they’re much better than Boca. I’d recommend the Southwest “flavor”. You need to get the vegan corndogs next time you go there. That’s what HTT is famous for. 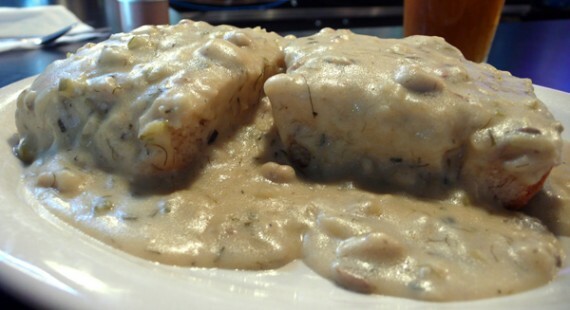 ugh those biscuits and gravy look amazing. so much gravy. Last Summer, I put bbq sauce on some Boca burgers and grilled them on the barbecue. I also grilled the buns. Then I topped them was some veggie cheese. I only want to eat them this way now. The sad thing is, I live in an apartment and we are not allowed to bbq on our back porches. I hate living in the city. The vegan corndogs are totally deserving of all the hype; I dream about them. 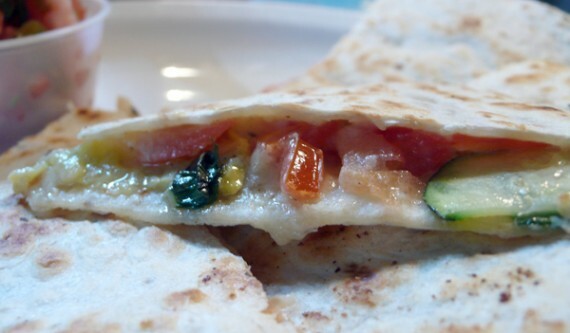 They make a mean vegan reueben there, too!